This rare flag of 37 stars is unique in my experience, in that it has a wonderful printed double-medallion canton in the style of a smaller printed parade flag, yet is large and of pieced-and-sewn construction with sewn stripes and a sewn hoist. One particular trait of certain small printed parade flags primarily of 29 stars through 36 stars is the presence of a large center star surrounded by a border, known in collecting as a "halo". The halo emphasizes the center star and adds more visual interest to the flag. This flag features a large haloed center star much in the style of smaller haloed parade flags. 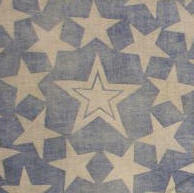 The flag also features an unusual arrangement of three stars per corner, whereas most medallions often have just one. Its large, clamp-dyed cotton canton has faded to a wonderful dusty light blue, which is offset beautifully by vivid, bold red stripes. For some reason, flags of 37 stars are somewhat scarce, compared to flags of 36 or 38 stars, despite the fact that 37 was the official star count for a period of ten years. The actual period spanned from Nebraska's statehood on March 1, 1867 to Colorado's statehood on August 1, 1876. 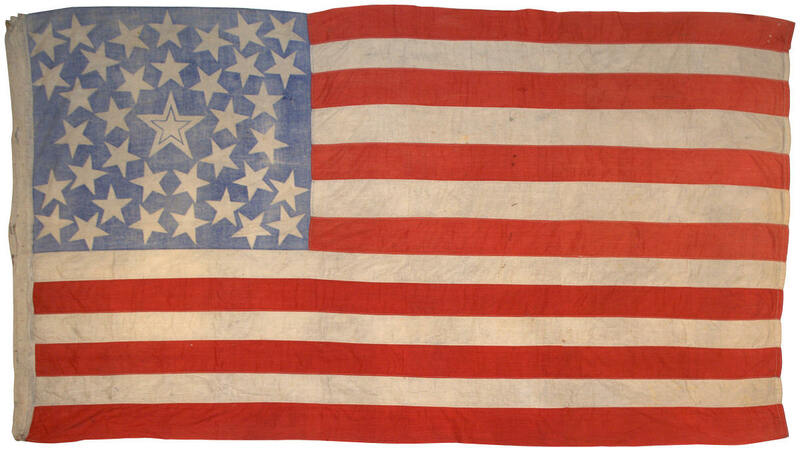 The reason for a scarcity of 37 star flags is speculative, but during this time of Reconstruction following the Civil War, there was a general lull in patriotic fervor, compared to during the war or during the Centennial of 1876, and fewer flags seem to have been produced at home or manufactured during this period. Although at the time of the Centennial on July 4, 1876, 37 stars was still the official count, it was well known that Colorado's statehood was impending. Most manufacturers produced 38 star flags for the Centennial, not bothering to produce large quantities of flags that would soon be outdated. Regardless, the style of this particular flag is rare and extraordinary. Its extremely festive canton leads me to believe that it was most likely produced for the Centennial celebration, though with the actual proper star count of 37. The flag remains as one of the great period flags of the time, representing the celebratory mood of the country which, having so recently weathered the gravest threat to the Union during the Civil War, was now entering a new period of peace and great optimism.